There is anger over the way fire stations are being shut to save money, with an exclusive 7News poll showing most people think it is a threat to the community. The vast majority believe the NSW Premier has broken his promise about frontline services. They are the lifesavers we call when we need rescuing but new research shows the Premier’s promise to support them needs salvaging. An exclusive 7News ReachTEL poll reveals just 14 per cent of voters believe Premier Barry O’Farrell has honoured that promise while 86 per cent are unsure or think he has failed. “He made a promise that he would not cut frontline services,” says Jim Casey, of the Firefighters Union. 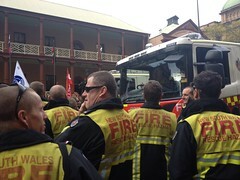 Firefighters campaigned against the government at the recent Miranda by-electionand have vowed to continue. They are angry about stations closing when a firefighter calls in sick – instead of paying replacements overtime. Opposition leader John Robertson said: “People are rightly concerned about their own safety. This government is playing Russian roulette by closing fire stations right across NSW randomly. More than 83 per cent believe temporarily closing fire stations is a threat to the community while less than 23 per cent support shutting stations. Mr O’Farrell refused to discuss the alarming poll result instead leaving it to the Emergency Services Minister to explain that the Premier had not broken any of his promises.